Featuring some of the finest original photography and all-new text, BMW Ultimate Drives Vol 1 eschews familiar historical descriptions and focuses squarely on driving experiences as author Jeremy Walton whisks the reader on a high-octane journey through BMW's history from 1937 to 1982. Re-assessing a carefully-chosen selection of the company's most iconic machines, Walton puts you in the driver's seat as he goes into unparalleled depth about what it's like to steer such seductively rare combinations of V8 power and coach building art as the legendary 507, the classic 3200CS, road and race versions of the E9 Coupes and pre-war greats like the iconic 328 and its darker-horse sibling, the 327/28 Coupe. 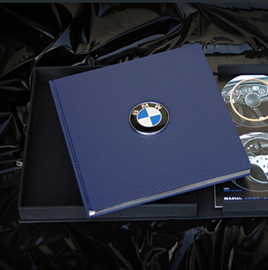 Comes with launch poster and clamshell case that has a genuine BMW Roundel badge on the front.